Why You Should Choose Us We love each and every one of our patients, and we do absolutely everything we can to ensure a top-notch oral health. We are a big, happy dental family, and we invite you to join us! What To Expect On Your First Visit Our team is so excited to meet you! During your first visit, you will experience our warm, friendly, and cozy environment, and you will also find yourself laughing with our dentists and staff. Give us a call now to set up an appointment! DeMercy Dental In the Community We do our best to participate and give back to the community. We invite you to join us at our next community event! We would love your support, and we would love to see you. Welcome to DeMercy Dental! We are here to give you a wonderful dental family. 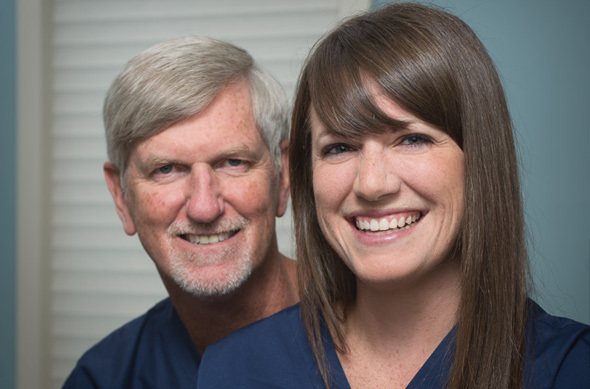 Combined, Dr. Jeff DeMercy and Dr. Amanda Kossick have been in the business for 30 years. We pride ourselves on providing a comfortable, friendly, and accepting environment to everyone who comes into our office. Our team does not focus solely on business; we focus on giving our patients individualized, loving care that grants them the best life and oral health as possible. We love seeing generations grow up throughout the years we are here—from grandparents to great-grandchildren—and we love having rapport with all of our patients. We are a comprehensive dental practice that is very relaxed, warm, and inviting. We provide a homey feeling in the office that welcomes and comforts each patient who comes in. We love helping everyone start and end the journey to their perfect smile, and we love educating them on how they can have a healthy oral lifestyle. We help our dental family members reach the smile they have always wanted, and we love doing so while we have fun, joke around, and get to know each other. We are so excited to work with you and your family! To become more familiar with our practice, please feel free to browse our website and give us a call. Dr. DeMercy and Dr. Kossick are pleased to provide gentle, personalized dentistry in Roswell, Georgia, and the nearby areas of Woodstock, East Cobb, Sandy Springs, and Alpharetta, Georgia. We look forward to hearing from you!